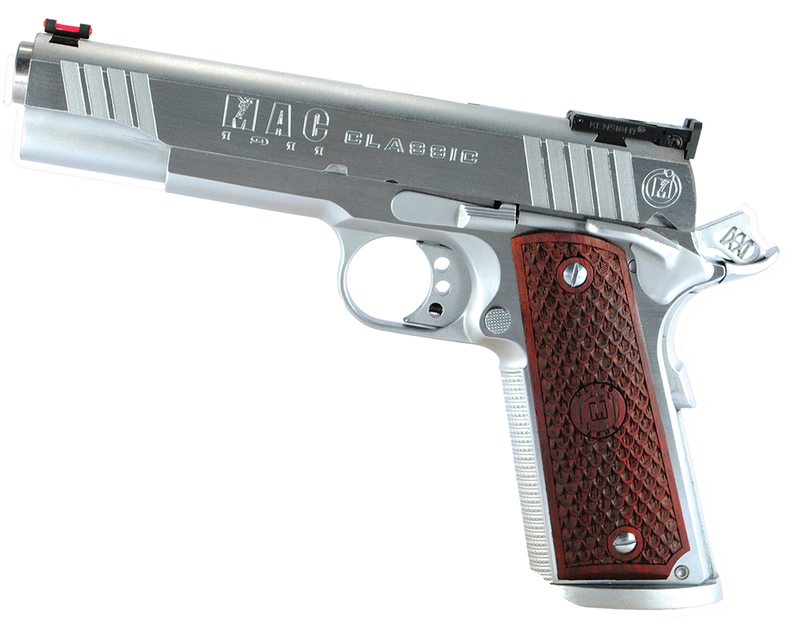 The MAC 1911 Classic is a 45 ACP single action with a 5" barrel and 8.88" OAL. Height is 5.56" with the weight of 40.56 ounces. The frame is made of 4140 steel; slide is made of 4140 hammer forged steel with wide rear serrations. It comes with fully adjustable Bomar-type rear sight and dovetail fiber optic front sight. The 1911 Classic has a flared and lowered ejection port, standard slide stop, ambidextrous thumb safety, and enhanced beavertail grip safety, skeletanized hammer, combat trigger, checkered front strap serration, and ramped match-grade bull barrel. It features custom hardwood grips with the MAC logo.